It has long since been suspected that Samsung’s Galaxy S5 could spawn two separate editions. The first model, from what we’ve gathered, will be a relatively high-end affair, while the second will be an outright powerhouse, packed with all the very latest tech. More evidence has today emerged to corroborate this notion, thanks to a new set of leaked benchmarks, which paint a more specific picture of what’s in the offing. When the Galaxy S4 hit the scene last year, one model packed an Exynos 5 Octa-core chip, while the other had to settle for a quad-core SoC, but this was the only real difference between the two. 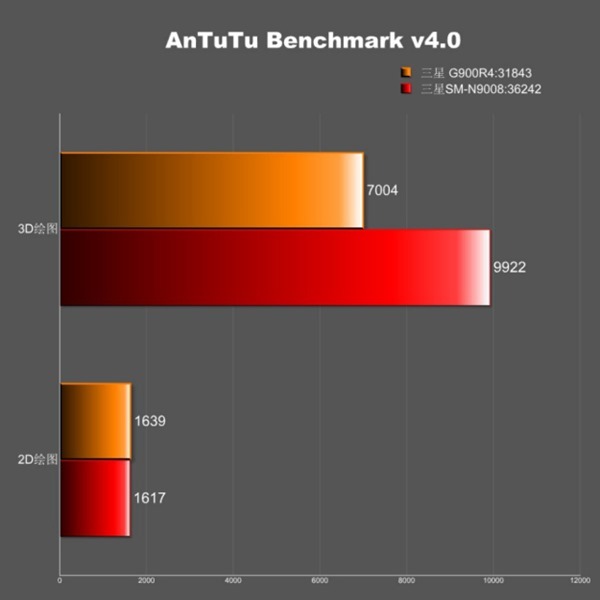 With the Galaxy S5, we’re now firmly under the impression that there will be two very distinct handsets arriving, with new AnTuTu benchmark results suggesting that they will carry the hardware names SM-G900R4 (for the U.S) and SM-G900H (Europe). Recent evidence has suggested that the two devices will offer very different lists of hardware specifications, a sentiment that many an analyst has echoed for weeks. In fact, KGI Securities” Ming Chi Kuo – well-known for his accurate assertions on upcoming tech products – has used the definitions “Prime” and “Standard” to differentiate between the two models of the Galaxy S5. 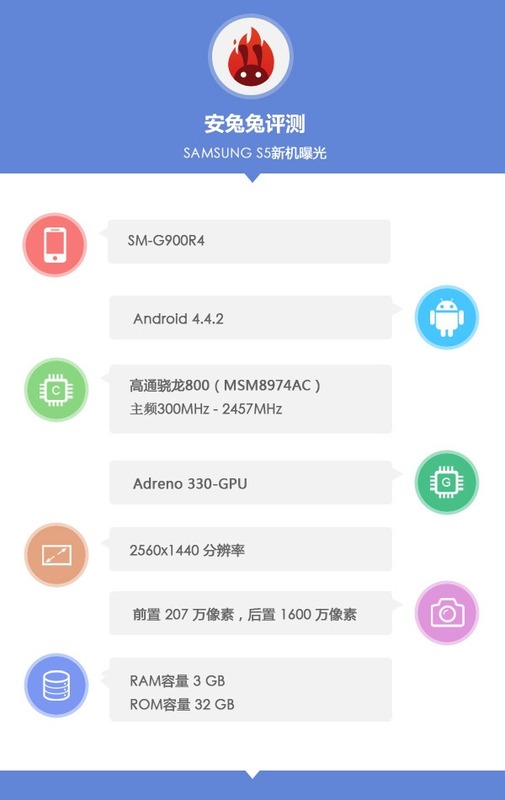 It now looks like the Prime model, which will be the U.S. cellular SM-G900R4 version if these AnTuTu findings are anything to go by, will pack a 2K, 2560 x 1440 display, a 2.5GHz quad-core Qualcomm Snapdragon 800 chip, Adreno 330 graphics and 3 gigs of RAM. As for storage, one can expect 32GB as standard, with the to-be-expected option of added real estate via microSD. The rear-facing camera of the prime edition will be a 16-megapixel affair (allied to a 2-megapixel, front-facing, video chat camera), and one can expect the device to run Android 4.4.2 KitKat out of the box. The Standard model, meanwhile, would be device SM-G900H built for the European market, and packs slightly-less impressive overall specs. 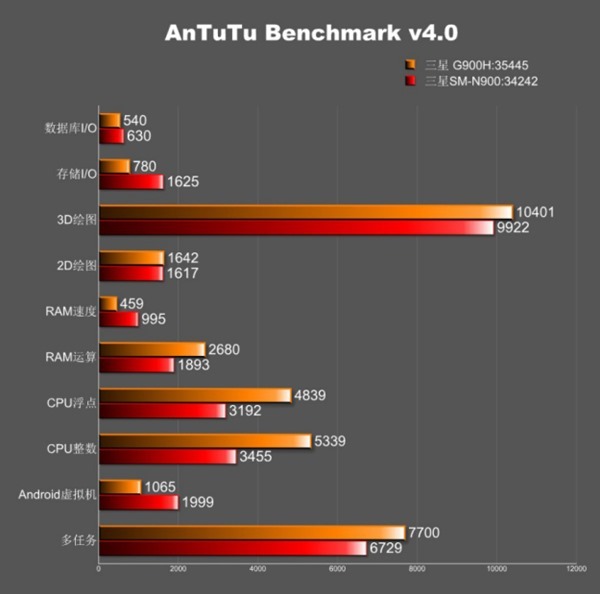 Take nothing away, however, because according to the AnTuTu leak, there’ll still be a 1920 x 1080 display, 1.5GHz octa-core Exynos 5422 processor, ARM-Mali-T628 graphics, 2 gigs of RAM and 16GB of on-board storage – more than enough for most folks. Moreover, the benchmarks also suggest that the front and rear cameras will be 2-megapixel and 16-megapixel respectively, so while there’s no telling whether Samsung plans to pack the same snapper in both handsets, it would seem likely that it would.